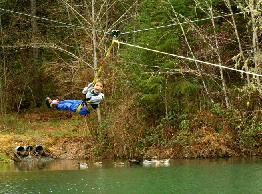 For more Zip out of your rope swing ride, consider a Zip Line! That's the term given to this newer technology with more spacious prospects for fun. Imagine a rope swing, where the rope is actually pretty short, but the point it is connected to is on a moving wheel set which slides down a long cable. There is inherently more complexity and danger with zip lines, so be careful! But at the same time, more possibilities for speed and fun. There is just more movement. 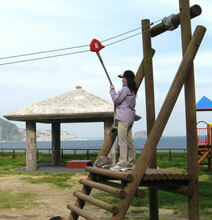 Zip lines have been springing up in outdoor adventure locations for many years. See below for a link to world zip line locations. You can easily work in some rides in exotic international tours such as Costa Rica or Mexico, in forests in many of the United States, and even in some urban settings. Tours as you will find are very strict about safety - helmets, gloves, harness all required. Among great things to see on a zipline tour are the trees of the local forest: habitats, wildlife, leaves, and density. One of the big challenges of the zip line ride is the reset. It's easy enough to get to the lower end. But in order for anyone to have another go, both rider and the rope / saddle / trolley (the thing with wheels to which the rope attaches) need to be moved again to the launch pad at the top. Mostly, that is still done the old fashion manual way: the rider hoofs it and pulls the seat by a tether. Zip lines for public tours have been set up covering hundreds of yards. But there are still many smaller scale versions. For a private residence, it's still worth considering if you have less than 30 yards. For smaller passengers, that's still a fine thrill! For friendly neighborhoods, think about teaming up with 2 or 3 of your neighbors to cover all your yards and get more distance. Have a professional inspect your work when building a zipline yourself. And think carefully about the landing zone and how the trolley and rider will be slowed down safely. Zipline Rider is a useful site for fans and here is their page of world commercial courses. This nifty example has the rider whisked over the lake at no greater than eight feet above the water. Extra refreshing in the summer time when you want to get wet. This zip line has dynamics of low flight: the rider actually needs to worry about feet dragging on the ground. This is a plus for safety, a minus for thrill. It may be better here to raise the cable level, or at least provide a seat which is more easy to sit on with raised feet. The Zip Line in this photo uses a pair of cables. This is a little more safe, but mainly serves to keep the rider and trolley in a vertical position without any drift to either side. The dual cabling is a must for locations without much side room. It also helps to ensure an uninterrupted ride. The side movement can in some cases cause the trolley to slip the cable and the wheels to stop. 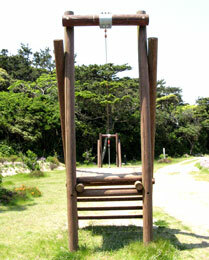 This basic zipline features a launch pad made of timbers laid horizontally about six feet off the ground, supported on an a-frame foundation. But as long as the launch pad is safe to access, and higher in elevation than its destination, anything goes. A zipline can have its launch pad in a tree, on a rock, on part of a building, on a structure, on a ladder, or suspended from a tree or other high point.